The TinyURL for this page is http://tinyurl.com/eccservercommands. Connect to another server on the EcoCityCraft network. Privately message another player anywhere on the network. Note: If the player isn't on the same server the name will be case-sensitive. Checks the last login time of a player on the server. This will also show any previous usernames used by this player. Find out who a nicknamed user really is. See our custom help information displayed to you on screen. See the message of the day. See our available help information pages displayed to you on screen. This will teleport you to our tutorial which gives you many tips on how to play ECC. Access the Decorative Head Database. For more information about Decorative Heads visit the Head Database page. Search and view all available Decorative Heads in the Head Database. This will teleport you to your default home named "home" if you only have one. If you dont have any homes it will teleport you to your last bed location. If more then one home is available a list will pop up showing your available homes ready for access, in which case use /home homename -or- /h homename. Receive a basic starter kit to use on ECC! This will help you get started in our world and jump right into building, mining and more! This can only be used once every 12 hours! Receive a piece of flint to help you identify what town you are in and more by right clicking it on any block. This can only be used once every 24 hours. Get the short name and the material name of the item you are holding in your hand. Check the remaining durability of the tool you are holding. Sends a message to any user, offline or not. Trade 2 spawners from the Spawner Crates in your inventory for 1 spawner key! Shows you what the server time is. Teleports you to a wild land area in the current world you are in. Teleports you to a random wild area which can be either land or water. Teleports you to a wild area in the current world you are in and ensures that spot is on land. Teleports you to a wild area in the current world you are in and ensures that spot is on water. 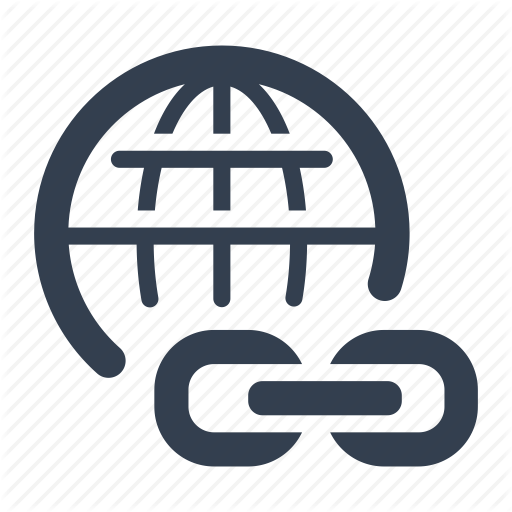 Provides links to all information regarding supporting the server and buying certain EULA compliant Server Features. Provides a list of Server Features you currently own. List of server warps you are able to teleport to. spawn- takes you to the Rising spawn. market - takes you to the user based in-game market. station<#>(1 - 10) - takes you to a specific station in the market. starcasino - takes you to the Star Casino Rising. end - takes you right to the front of the end portal in Rising. nether - takes you right to the front of the nether portal in Rising. mining - takes you right to the front of the mining world portal in Rising. shops - takes you to the main shopping area at spawn in Rising. colorshop - takes you to the color shop located at the spawn marketplace in Rising. expshop / enchant - takes you to the exp shop located at the spawn marketplace in Rising. starshop - takes you to the star shop located at the spawn marketplace in Rising. blockshop / shop - takes you to the block shop located at the spawn marketplace in Rising. foodshop - takes you to the food shop located at the spawn marketplace in Rising. pvpshop - takes you to the armor and weapons shop located at the spawn marketplace in Rising. tutorial - takes you right to the beginning of our tutorial located in Rising. Teleport to the warp specified in the <warpname> field. Use "/warp" to see a list of warps. Access the EcoCityCraft Easy Travel interface. This is not possible in the Nether/End without the teleport feature. ex: " /worth diamond 10 " Will show you how much 10 diamonds are worth even if you don't possess them. /worth all will give you the worth of all the items in your inventory. Sell items to the server. ex: /sell dirt -5 (This will sell every piece of dirt located in your inventory EXCEPT 5 OF THEM!) Useful if you have alot of dirt but only need 5 to place for example. Not typing in the player's full name can result in money being sent to other players - no refund will be given. The minimum payment amount is $5. You can use this system to safely trade items and money directly with another user. You must be in the same world as your trade partner. Accept an incoming trade request from another user. Claim an item that has not been owned or to complete or cancel a trade. Trade a currently owned item to a player. This will add the player, not change it over. Once the user receives the item, they must do /own on it to complete the trade as stated above. Remove ownership from an item that you currently own. You must include the # sign before the unique ID when running the command. -<townname> = Region you are a member of. +<townname> = Region you are an owner of. Gives you information on any region. To find a region name, right click flint on any block part of it. Remember "/kit flint" gives you a free piece of flint. Right clicking blocks with a piece of flint allows you to see if that area is currently a region or not, as well as whether or not you can build there. Using this command will tell you the region information for the block you are currently standing in - or flying over. Automatically places a bid with the correct increment in the current auction. <amount> is how many of the item you're auctioning. <starting price> is the lowest price you want for the item. [bid increment] is not required. It is the minimum difference between bids The limit for increments is $1,000. [buyout] is not required. When someone bids this amount, they automatically with the auction. Place a bid on the current auction. View info on the current auction. Filter out all but the essential auction messages. For more info on Auctions, go to our Auction Information page. Add a member to a region/nation that you are an assistant owner of. The only way to become an assistant owner is if the Mayor adds you as an owner to the region. Only Mayors can add/remove owners. Remove a member from a region/nation that you are an assistant owner of. The only way to become an assistant owner is if the Mayor adds you as an owner to the region. Only Mayors can add/remove owners. Takes $10,000 ECD from your balance and gives you your own head. Add an assistant owner to your region. They will be able to add/remove members from the region. They cannot add/remove owners unless they have a mayor rank. Remove an assistant owner from your region. Removes all owners from your region. WARNING: Will also remove your name from the town owner list. Removes all members from your region. WARNING: Will also remove your name from the town member list. Use this command to sneak around at full speed. This means that to everyone else you look to be sneaking and your name tag doesn't appear behind walls while in reality you are able to move at full speed! Shows you the available kits that you currently have access to. /kit tnt (*There is a 1 hour delay with this kit. Gives you 5 blocks of TNT + 1 piece of Flint and Steel to light it. There is a 1 hour delay on this kit, meaning you may only use it once every 1 hour. LWC Protections Allows you to protect chests, doors, furnaces, signs and more and is available to everyone in *Rising*! Main LWC command showing the full LWC menu. Use this command then left click or punch the chest/door you want to make private only to you. No one will be able to access this chest/door but you. This is the RECOMMENDED command we want you to use. To see a list of blocks you may place LWC's on, visit he LWC Protections page. 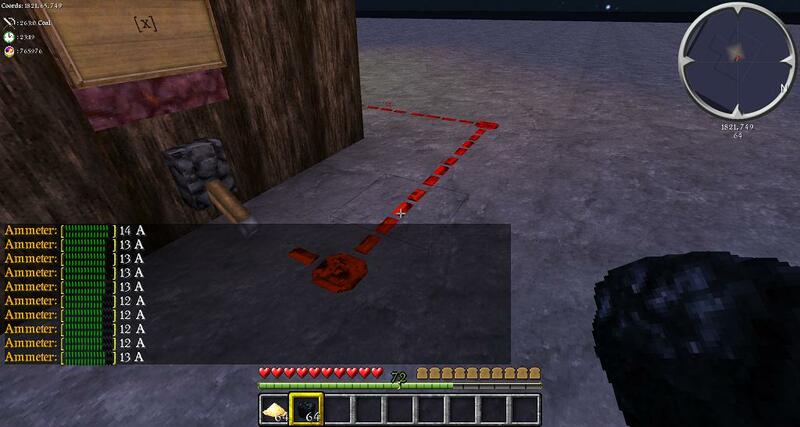 Use this command to toggle redstone protection to open your doors (ex: pressure plates). By default redstone is set to on (Meaning protection is on), so users don't open your protected doors with pressure plates as happened in the past, but when using this for example: "/lwc flag redstone off" and punching the door/object you want it to be active on will allow redstone usage on that object. This command adds, removes, or makes admins of a user on a private protection. Much easier than having to constantly remind your friends the password of whatever you protected so they keep typing it in. Example: "/cmodify andrewkm" and punching your protection would add andrewkm to your private protection while "/cmodify -andrewkm" and punching would remove him. /cmodify @andrewkm would make andrewkm an admin of the protection. Meaning he can now add/remove members as well, however he cannot change the original owners protection/remove him. Use this command then left click or punch the chest/door you want to make only openable with that password. This is mainly if you want to share the chest/door with a friend, if he unlocks it he also has access to it now as well. If you want to make a private chest/door only accessed by you we recommend you use /cprivate, it is more simple. Use this command then left click or punch a chest/door to make it a public chest/door. This means that everyone can use it and no one can lock or protect it untill you remove the public stamp on it. Useful if you want to give away free gifts, for example, "Free wool at my front porch!" Use this command to check your current limits. If you find you are far above them from the past before limits were introduced feel free to make an admin request to have your protections purged. This is the only way we can help you. We will not locate specific LWC Protections for you. Use this command then left click or punch any chest/door to view information on it. Information such as whether it's secured, protected, password-protected, its owner and so on. Use this command then left click or punch any chest/door that you previously protected to remove the protection on it. Use this command to enable/disable persist mode. This means your further LWC commands will be binded. For Example, use /cpersist, and now use /cprivate. From this point on everything you punch will be privated until you use /cpersist again to turn persist mode off. Purchase lottery tickets. If you do not specify an amount, 1 ticket will be purchased. You are able to purchase more than one ticket if you have the required balance for it. Shows the last 10 winners of the lottery. Disable lottery messages! Use this command again to re-enable them. Please note that this will revert on re-login back to showing messages. Displays the lottery help menu. This is the global channel. All users can access this channel. You can chat here with whoever is currently part of this channel. If it gets too big and noisy just leave it and stick to the local channel to chat with people currently around you. This is the trade channel. All users can access this channel. All trades, items for sale, store advertisements (Not spammed however), and anything sale/trade related MUST always go into this channel. There are no exceptions. This channel is also to be used only for trade. Nothing else. If you'd like to make an auction you may announce it in this channel and ask users to join you if interested in the auction channel.) Starting an Auction example "/ch trade" (To enter trade channel) Now say: "Hey everyone 25 diamonds going for auction! JOIN me in auction channel if your interested! Use /ch auction command! See you there! - Now you join "/ch auction" channel and carry on with your auction. This is the auction channel. All users can access this channel. Auctions may only go in here as they heavily spam the chat. You may leave this channel at ANY TIME using the "/ch leave auction" command. You can also use the /auction spam command so you can ignore only the messages that have been marked as "spammy". (Bid broadcasts, timer broadcasts) instead of entirely leaving this channel. This channel is ONLY for Auctions. This is the trivia channel. All users can access this channel. Players can ask trivia questions in this chat and sometimes they may offer prizes! This chat is only to be used for trivia questions however, and not for general chat. This is the Nether Channel! We ask you keep all nether talk while in the nether and battling to survive in this channel! Please leave global and talk in nether while you are there. This is the End Channel! We ask you keep all end talk while in the end and living peacefully in this channel! Please leave global and talk in end while you are there. This is the Mining Channel! We ask you keep all mining talk while in the mining world and surviving in this channel! Please leave global and talk in mining while you are there. This channel is only for those who have alert giving permissions. You cannot speak in this channel, nor can you leave it. It is simply to get all server alerts to you. With this command you can send a private message to another player that is online at the moment. These messages are private to you and the player you are messaging and are not visible to the users currently online on the server. Quickly reply to the last person to /msg you. This message will be broadcasted to the entire server. There is no possible way of leaving the shout/advert channel to not see those messages! Using this command allows you to completely bypass the CAPS filter. You may type in all caps, in tons of funky characters ex: (~~--~~ || BUY NOW || ~~--~~), etc. /shout Buy from my block shop!!!!! Using the above command will shout the message in the default bright green color. /shout &dBuy from my block shop!!!!! Using the above command will shout the message in a bright pink color. Check out the following chart for a list of colors: Click here for colors! or by using the /help colors / colours command in-game. Users will not be punished for using any amount of characters/CAPS. You may type in all CAPS, even in all characters. There is simply no rules (Other then below) to using /shout. Multiple spam is as well allowed. If you feel like you must flood the screen with your advertisement, by all means, do so. You are the one spending a ton of money doing it. Note that shouts only broadcast on the main server. They do not broadcast across the network. No outside advertisements non related to the EcoCityCraft server. This displays a help menu listing a brief description of all the available commands. This displays a list of visible channels. A channel that has a * infront of its name means you are currently in that channel and listening to it. To stop listening to it use the leave command shown below. List of players that are currently in your active channel. Sets your active channel. For example type "/ch global" to chat in the global channel by default when pressing your chat button " t " and typing a message. This is also the same as joining a channel however it also sets it to your active channel. ex: "/ch global" makes you join channel "global" and change it to your active channel. Same thing as above command except doesn't change your active channel. ex: "/ch join global" while using channel local as your active channel allows you to join the global channel (To see messages in it) while keeping your default channel set on "local"
Use this command to ignore or un-ignore a player. If you don't provide a name while using this command, it will show your ignore list. ex: "/ch ignore kevin" now un-ignores him if hes already ignored. Ignore incoming private messages from other users, use this command to not accept private messages but not ignore individuals. Use this command to make the message '<AFK>' show up whenever someone PM's you. If you put a message after '/ch afk' it will show that message. Reusing the command will turn off the afk message. ex: '/ch afk Busy' will show '<AFK> Busy' when a PM is sent. Another great reminder! Using command "/tell <username>" Will start a personal convo with the person of choice. Every time you type in chat afterwards will go to that person! Use command "/tell" to cancel the convo. This command will display the help of the command you used. ex: "/ch ignore ?" Shows the ignore help file. Information on the Automatic Banking System commands used in game. Deposit EcoDollars from the server balance into your Forum Bank! Withdraw EcoDollars from the Forum Bank and send them to your server balance! Check your Forum Bank balance in game. Provides a brief description of the mod. Displays a list of mcMMO commands. excavation - get rewards for digging stuff! herbalism - get rewards for farming stuff! mining - get rewards for mining stuff! woodcutting - get rewards for chopping stuff! axes - get rewards for hacking at stuff! archery - get rewards for shooting at stuff! swords - get rewards for slashing at stuff! unarmed - get rewards for punching stuff! acrobatics - get rewards for jumping off stuff! fishing - get rewards for fishing stuff! alchemy - get rewards for brewing stuff! Displays a scoreboard showing the levels of each of your mcMMO skills. Locks or unlocks a party you are the owner of. Invites a player to your party. Sets the owner of a party. Sets a password on a party. Kicks a player from your party. Renames your party. You must be the leader of the party to rename. Disbands and removes all players within your party. These commands can be with supporting the server by shopping for various EULA compliant features within our server store! All Supporters can bypass server player Limit! Meaning if the server is full you will still be able to join without kicking anyone off. You will simply make the server go over the player limit. All Supporters can enter and chat in VIP chat in-game. Use "/ch v" or "/ch vip" to join. Supporters have the ability to leave all in-game chat channels to clear their screen up from any excessive chat they do not like. Enables 2 factor authentication for your account - for those concerned about account security. Best paired with Google Authenticator App or Authy. Logout of /2fa to force /2fa on next login. This means even if you login via same IP, you will still be required to input /2fa on next login. These features can be acquired by purchasing them with In-Game EcoDollars! Flying is available to assist you in major projects. Not available in the nether or miningworld, except with the Fly/Speed+ feature. Activates creative minecraft flying! Use it the same way you use fly in creative mode! Not available in the nether or miningworld. Changes your flying speed! For example use command "/speed 10" to fly at top speed while in creative flight mode, or use "/speed 6" for a bit more steady flight control! Remember to activate your creative flying with /fly to enable your speed! The /back command is available to assist you in returning to your last location after dying or most forms of teleportation events, such as using /home and then /back to return to your exact last location. Very useful when mining, using /home to store your previous goods in your secure chests, and then following with the /back command to go back to that exact mine location. The /back command is great for assisting users in going back to where they were right before they died as well which is great for item retrieval after dying. Only available in the nether with Back+ feature. Use this command to access your current PlayerVault! From here you can move things around any way you wish! The starter PlayerVault comes with one extra double-chest of inventory. Additional plus packages are available to increase your PlayerVault storage capacity up to a maximum of 91 extra double-chests of storage! The best thing of all: your items do not disappear as your inventory does when you die! Access and use the EcoCityCraft Easy Shop interface while in the nether or end. Teleports you to the block your cross hair is directed at. Simply allows for quicker travel. Do not attempt /j across the border as it will load unnecessary chunks and may impact the server negatively [server spikes]. There are known bugs with /j, that may teleport you underground. /j is also restricted to certain distances as well. Not available in the nether. Teleports you to the highest block above you. Useful for escaping caves. Gives you a free compass. This command can only be used once every 12 hours. By holding a compass, everytime you left click you are basically using the /jumpto command. This is a great fast way to jump around and travel! Teleports you to the x and z co-ordinates of your choice. This will place you on the highest possible block in that area. Use this command to set the current location as one of your homes. The name of this is defined by what you put after the /sethome command. Example: "/sethome farm" Will set the current location as your home named farm. This will teleport you to your default home named "home" if you only have one. If you don't have any homes it will teleport you to your last bed location. If more than one home is available, a list will pop up showing your available homes ready for access. Use this command to teleport to the home of choice. Example: "/home farm" will teleport you to the location you set with the example above named farm. This command allows you to delete a specific home. Example: "/delhome farm" will delete the home named farm. ex: "/ptime day" With this command, say the time was night, it will change it to daytime for you, however if you are outside monsters will still spawn around you, as the server's real time is not effected. ex: "/ptime @day" With this command your time will stick to day and never change. Great for building outside and not having the nighttime bother you too much! Use this command to repair either the tool in your hand or all the tools in your inventory. You will not be punished for repairing other users tools for a price. That is simply another way for you to make an extra EcoDollar here and there as a holder of this feature! This command will clear your inventory. Tired of having garbage on you from time to time that you cannot sell to the server? You now have a quick way to get rid of it all! /near <radius> - Not available in Nether/Mining world. Check users who are within your radius. The default/max radius will be 500 blocks in any direction. Using /near 5 for example will tell you who is within 5 blocks from you. This command is great for finding out who a mob disguised player really is! Say there is a sheep following you and your certain it’s a player. This will allow you to use /near 10 for example and find out who it is. Warning: Any user caught abusing this in anyway such as spamming "/powertool pay bob 1" constantly will face punishment and have the feature immediately removed with no refund. This command is to make a few tasks easier for you, not to spam your peers. As well there is to be no command spamming, such as binding the repair hand command to a shovel and using it. You are constantly executing the command by doing this thus spamming the console/log files. Bind your command, use it when needed, and clear it or use a different tool. Note: To clear a current items powertool simply run "/powertool" while holding it in your hand. Use this command simply as it is written "/powertool d:" and hit enter to remove all your powertools. Great if you've forgotten what items are assigned to what powertools and are using random commands accidently. This command will simply clear your entire powertool file so you may start over. Use this command to toggle your powertools. Say you have set up a great many of them and remember what each of them are, however you would like to temporarily disable them and only enable them when needed. This is exactly what the /powertooltoggle command is for! Use this command to open up your enderchest anywhere you are and edit it as you see fit! Now you carry one on you at all times! Use this command to repair either the tool in your hand or all the tools in your inventory. This will work on enchanted tools! You will not be punished for repairing other users enchanted tools for a price. That is simply another way for you to make an extra EcoDollar here and there as a holder of this feature! Use this command to spawn yourself 1 anvil! This kit can be used once every 24 hours. Use this command to enable nightvision. It will be permanently enabled until you either toggle it back off with the /nightvision command once more, change worlds, or log out of the server! This is a great little feature to see things more clearly when mining! Use this command to automatically make any minerals into blocks without a workbench! For example: if you have 64 redstone dust and use /condense you will have 7 redstone blocks and 1 redstone dust left over. With ExtCommandsPlus2 your diamond tools will automatically repair themselves. The way this works is this: There is a repair done at 25% remaining durability as well as one done at 1% durability (In case you already have a tool under 25%). If you notice your tool is under 25% we still recommend you use the normal /repair command in the case your automatic repair possibly malfunctions (something that should not happen. You have the ability to color your tools using an anvil! Do this by using regular minecraft color codes. Please note the code "k" is blocked. As well if you are renaming a previously colored tool be sure to delete everything out of the box first as custom code from the plugin will remain even though you do not see it. Use ctrl+a to select everything in the box and hit your backspace key. Allows you to build several lifts that users can use to go directly above/below them! 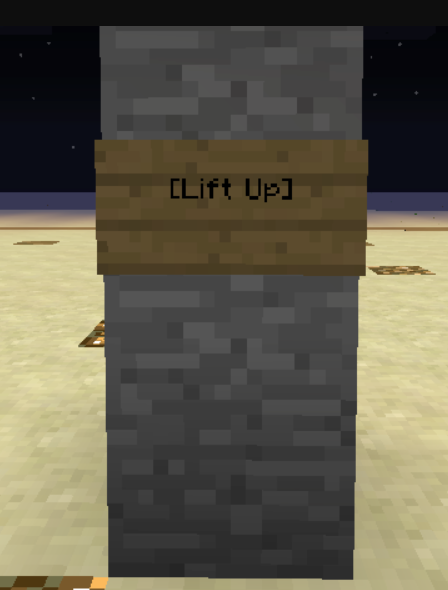 Lifts are created as follows: Each lift must have a sign infront of it with either: Line2: [Lift Up] or Line2: [Lift Down] Here is an example of a Lift! Lift Sign Note: Dont forget to cprivate/cpublic your signs. They respect LWC permissions. 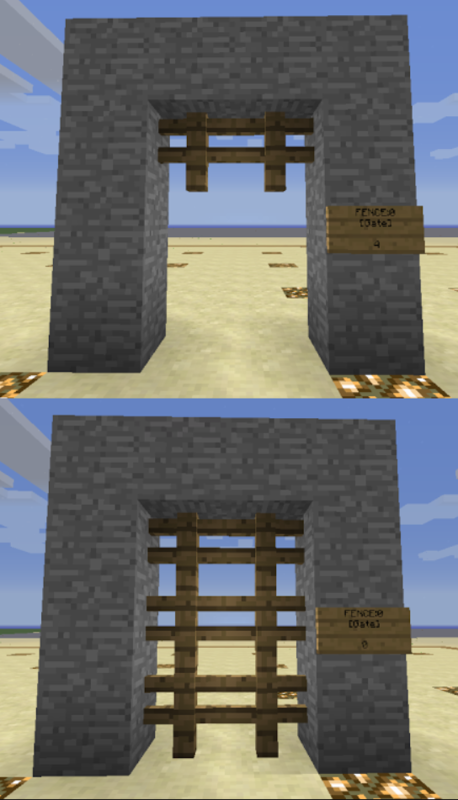 Allows you to build a gate that can be toggled with a sign as well as redstone linked to the sign! Gates are created by placing a sign with the word [Gate] on the second line. The sign must be placed right beside your already built gate on a wall. As well you must either fully build the gate or stock your sign up with the right material by right clicking it. Here is an example of a gate! 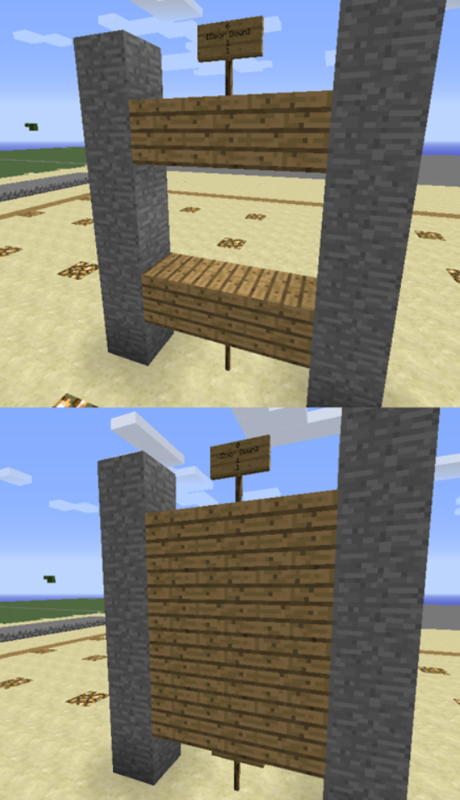 Gate Opened/Gate Closed You can build gates out of wood fences, nether fences, and more exact list found on the ExtCreations feature page. Note: Dont forget to cprivate/cpublic your signs. They respect LWC permissions. 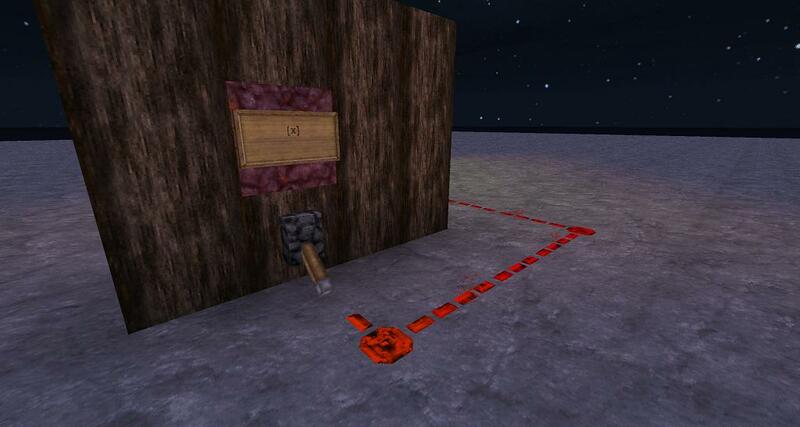 Allows you to build a door that can be toggled with a sign as well as redstone linked to the sign! Doors are created as follows: Below the bottom door platforms a sign must be placed reading: Line2: [Door Up] Line3: Left block width. Line4: Right block width. If no Line3 and 4 exist default will be 1 block to each side. Dont forget the sign at the top of the door. As well you must either fully build the door or stock your sign up with the right material by right clicking it. Here is an example of a door! Door Opened/Door Closed You may use many of our 5-20 cent blocks such as stone/cobblestone/netherrack and more exact list found on the ExtCreations feature page. 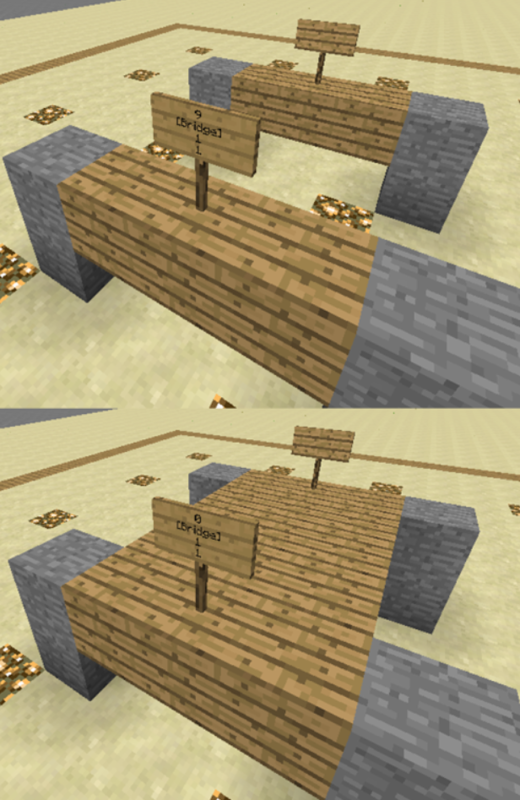 Allows you to build a bridge that can be toggled with a sign as well as redstone linked to the sign! Bridges are created as follows: Each Bridge must have a sign below or under the end platforms: Line2: [Bridge] Line3: Left block width. Line4: Right block width. If no Line3 and 4 exist default will be 1 block to each side. As well you must either fully build the bridge or stock your sign up with the right material by right clicking it. Here is an example of a bridge! Bridge Opened/Closed You may use many of our 5-20 cent blocks such as stone/cobblestone/netherrack and more exact list found on the ExtCreations feature page. Note: Don't forget to cprivate/cpublic your signs. They respect LWC permissions. 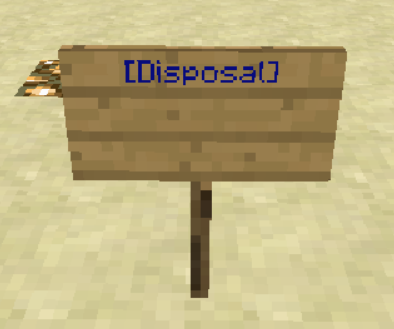 You are able to create Disposal signs. These simply act like chest garbage cans. Many times there is garbage in your inventory that you want to get rid of, and that isn't sellable. You can now do so easily with Disposal signs, or, well, garbage cans. - Don't litter! Help ECC and use the sign! To make one simply place a sign and type [Disposal] on the first line! That's it. Here is an example of the sign: Example Sign Afterwards open up the garbage can by right clicking the sign and anything you place inside will be gone. Use this command to open up a workbench anywhere you are! No more looking for that stored away workbench; especially after using your /sell all command and having it accidentally removed. Now you carry one on you at all times. Use this command to spawn yourself 8 signs. Signs are constantly used by ExtCreations users thus this gives you a quick way to get a few! You may use this kit once every hour. Use this command to spawn yourself 1 enderchest. Great way to store your stuff wherever you are in an instantly spawned enderchest! This command allows you to instantly smelt whatever you are holding! Keep in mind this comes with a cooldown. The cooldown is currently set at 15 seconds. This command allows you to instantly smelt everything in your inventory! Keep in mind this comes with a cooldown. The cooldown is currently set at 300 seconds. You are able to create hidden switches that may be toggled by right clicking the block where your hidden switch sign is on. Place a block and place a sign on it where the second line is [x]. Now you may right click this block from any side and toggle the switch it is connected to! Front of Hidden Switch Back of Hidden Switch ss in the above example you may right click the nether rack that the switch is on from the back of it and it will toggle the lever below. Great for puzzles; secret entrances and whatever your imagination can create! 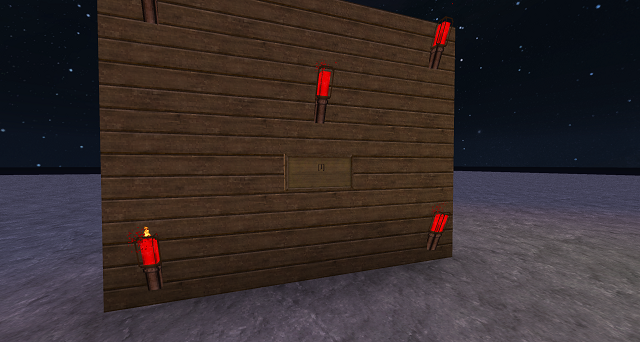 You are able to create light switches that may be toggled by right clicking the light switch sign. Simply make a sign with the following on the second line: "[ I ]" without the quotes and spaces of course and place a torch/redstonetorch above it. Now just right click it to toggle the torch on and off. Maximum range is 10 and maximum lights is 20. You may also customize your switch with the third and fourth line. This is used with a number value. Third line is your custom light range and fourth line is your custom max light changes. Lights on! Lights off! A nice little painting switcher for your benefit so you don't have to constantly break / create paintings to get that painting you want. Simply right click any painting and use your mouse scroll to pick the one you want! Your ExtCreations+ /smelt and /smeltall commands have no cooldown! Ability to place/use Shulker Boxes! Gives you access to our full LogBlock database! This works with the ice item. When holding ice you simply left click it on a block to see that blocks history. Alternately you can also right click it into an empty griefed spot to see the history of that specific section. You will also be able to click any chest to view the interaction history of it. This is great for town owners who are tired of waiting on grief reports to be handled and want to find out who did what in their regions immediately so that the specific user can be removed from their town upon investigation in a timely manner suiting their needs. 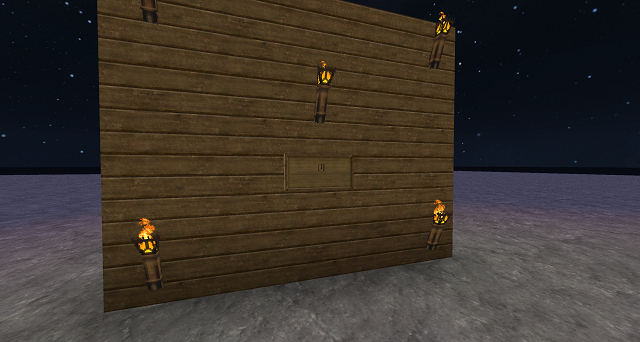 Your logblock tool will also work in all worlds, and all locations on the entire server. This means you can sell investigative services while online to those who require it! Spawn yourself a piece of ice to use with the investigation feature! 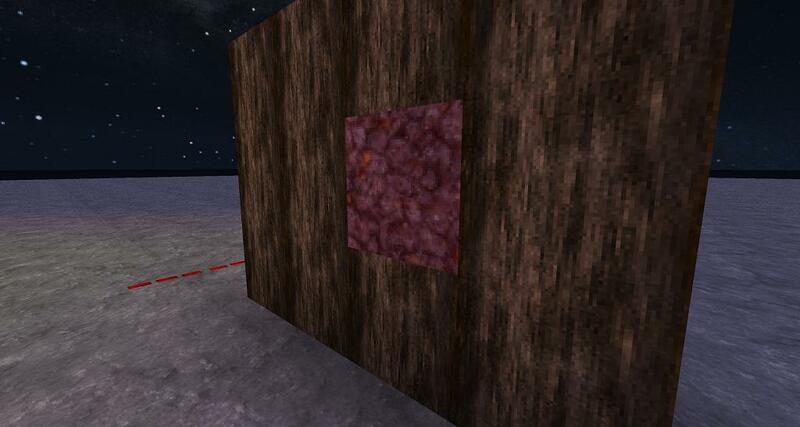 Turn logblock on or off. This is primarily used for when you would like to actually place/build with ice as opposed to right clicking it in a specific location to check the history of it. Ability to vanish from not only in-game but the /list command as well. You will be completely invisible from all players and you will be able to investigate your problems/issues in secret! You will not be visible in the /list command! This command allows you to check if you are currently vanished or visible. This command allows you to toggle a explosion effect that is given off when you vanish or unvanish. You need to toggle it again in order to turn it off. This command allows you to toggle a smoke effect that is given off when you vanish or unvanish. This command allows you to toggle a flame effect that is given off when you vanish or unvanish. This command allows you to toggle a bat effect that is given off when you vanish or unvanish. You are able to acquire this feature for the ability to have unlimited LWC Protections on our server. Use /climits to view your current protections. You are able to acquire this feature for the ability to place water with buckets! You also get the ability to place ice as well as use sponges to soak up water! The /kit water command spawns you some awesome water items every hour! Use this command while holding a bucket to fill it with water! Can be used an unlimited amount of times. Use this command while holding a filled bucket to clear it. Use this command to re-enable the suffocation and drowning damage. You are able to acquire this feature for the ability to place lava with buckets! As well with pyro you are able to light stuff with flint and steel. 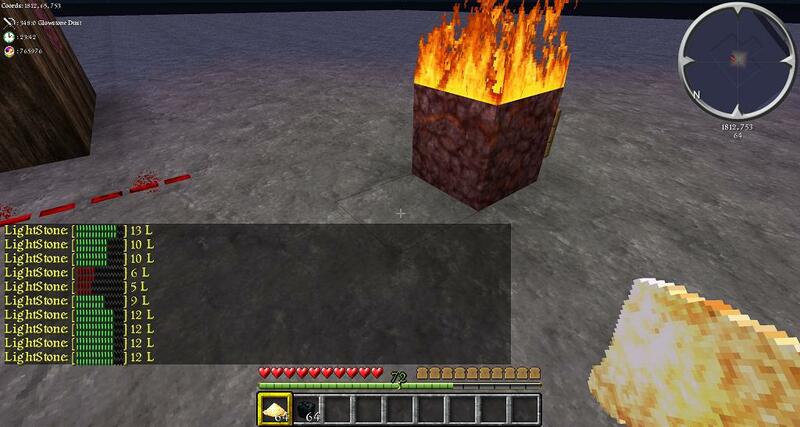 Use this command while holding a bucket to fill it with lava! Can be used an unlimited amount of times. Use this command to reenable the fire damage. Restores your entire hunger bar upon use. Use this command to disable auto-feed. Example: '/pet ocelot:black' spawns a black pet ocelot. This command allows you to spawn a pet cat. Example: '/pet wolf:black' spawns a wolf with a black collar. This command allows you to spawn a pet wolf. Example: '/pet pig:saddle' spawns a saddled pig. This command allows you to spawn a pet pig. This command allows you to spawn a pet cow. This command allows you to spawn a pet chicken. Example: '/pet sheep:black' spawns a black sheep. This command allows you to spawn a pet sheep. Example: '/pet slime:small' spawns a small slime. This command allows you to spawn a pet slime. This command allows you to spawn a pet mushroom cow. Example '/pet rabbit:white' spawns a white rabbit. This command allows you to spawn a pet rabbit. This command allows you to spawn a pet spider. Example: '/pet zombie:villager' spawns a villager zombie. This command allows you to spawn a pet zombie. Example: '/pet skeleton:whiter' spawns a whither skeleton. This command allows you to spawn a pet skeleton. This command allows you to spawn a pet cave spider. This command allows you to spawn a pet bat. Example: '/pet creeper owered' spawns a powered creeper. This command allows you to spawn a pet creeper. Example '/pet villager:blacksmith' spawns a blacksmith villager. This command allows you to spawn a pet villager. Example: '/pet pigzombie:villager' spawns a villager pig zombie. This command allows you to spawn a pet pig zombie. Example: '/pet magmacube:small' spawns a small magma cube. This command allows you to spawn a pet magma cube. Example: '/pet blaze:fire' spawns a fire blaze. This command allows you to spawn a pet fire blaze. This command allows you to spawn a pet endermite. This command allows you to spawn a pet snowman. This command allows you to spawn a pet silverfish. Example: '/pet horse:mule' spawns a mule horse. This command allows you to spawn a pet horse. Example '/pet guardian:elder' spawns an elder guardian. This command allows you to spawn a pet guardian. This command allows you to spawn a pet iron golem. Example: '/pet enderman:screaming' spawns a screaming enderman. This command allows you to spawn a pet enderman. This command allows you to name your pet. You can use color codes for this, however, &k is strictly forbidden. This command spawns a pet selector stick. Right click in order to use it. This command opens the pet selector menu. This command removes your current pet. This command shows some quick information on your current pet. This command brings up your current pet's menu. This command hides your current pet. This command shows your current pet after hiding it. This command is another way of doing both /pet hide and /pet show. It will toggle between the pet being shown and hidden. This command calls your current pet to your side. This command sets your current pet as your default pet. This command removes your current pet as your default. This command will show you all pet commands. This command allows you to stack pets, that you have access to, on top of each other. chicken, cow, horse, mushroomcow, cat, pig, pigzombie, sheep, villager, wolf, zombie. This command allow you to spawn a baby pet of any pets that you own. This command allows you to place your current pet on your head. This command allows you to rider your current pet. Use this command to transform into any mob part of the list of available mobs. Use this command to transform back into human form. Use this command to toggle whether you see your disguise or not. Available colors: black, blue, brown, cyan, gray, green, light_blue, lime, magenta, orange, pink, purple, red, silver, white, yellow. Place a block on your head! How silly! You can even see how you look by pressing F5. To remove the block from your head simply open up your inventory and take it out of the helmet spot. The /nick <nickname> command allows you to change your nickname! Your name will then appear in game with a ** sign in front of it, alerting users you are using a nickname. This command has a cooldown of 5 minutes. The /nick off command will remove your current nickname. This command has no cooldown and can be used immediately after selecting a nickname. This command will format your nickname with a strikethrough. This command will color your nickname any way you want. Use this command to open up the trails user interface and select a trail for your character. Mixing trails is allowed, simply select more than one that you have access to for a personalized look! Use the /trail clearall command to quickly clear all your current character trails. Use the /trail [trailname] command to toggle that specific trail on or off. Keep in mind you can mix trails as well for a personalized look! The following are all the trails currently available. Please Note that they are each individual features and each one must be acquired separately.